My Son, My Son, What Have Ye Done plays at the Kentucky Theatre on Saturday and Sunday only, September 25 and September 26. Revanche plays at the Bluegrass Community and Technical College Auditorium on Sept. 29th. Die-hard cinephiles will no doubt be rushing to the Kentucky Theatre this weekend for two exclusive screenings of the new film My Son, My Son, What Have Ye Done, mainly because the film is the product of two of the greatest cinematic minds in history, Werner Herzog (as director) and David Lynch (as executive producer). 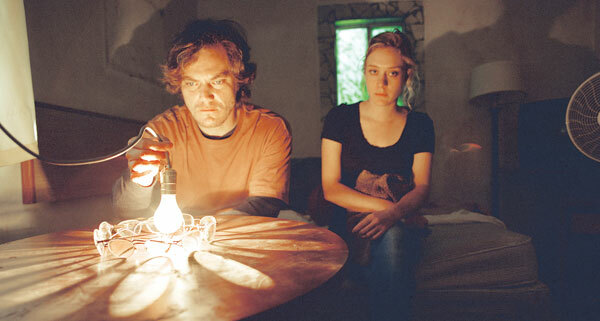 Fine acting enthusiasts should similarly be drawn to the theater by the murderer’s row of fine character actors in the film, among them Oscar nominees Willem Dafoe, Michael Shannon, Brad Dourif, and Chloe Sevigny. Considerably more well-adjusted types will likely avoid the theater completely after being informed about the weird film about a crazy person. And as much as it pains this die-hard cinephile and fine acting enthusiast to say, the latter response might be the best in this case. Pedigree, it seems, isn’t everything, and this surrealist doodle of the film is less than the sum of its impressive parts. Loosely based on a true story, the film tells the story of Brad McCullum (played by Lexington native and Henry Clay High School alumnus Michael Shannon, of HBO’s Boardwalk Empire; Bug with fellow Kentucky native Ashley Judd; Oscar-nominated for Revolutionary Road). Brad is an actor in a Greek tragedy who snaps one day and reenacts the play’s matricide in his own home before engaging in a hostage standoff with the local detective (Willem Dafoe). If the film sounds like a typical police drama, it isn’t – the question of what it actually is remains open. The film’s tagline states that “The Mystery Isn’t Who – But Why,” which suggests that the motivation behind Brad’s crime has something to do with the film’s many non-sequitur flashbacks: a visit to the ostrich farm owned by Brad’s uncle (Dourif), a mysterious enlightenment and possible conversion to Islam in the jungles of Peru, a trip to a military hospital where Brad insists of “visiting the sick in general.” There’s a pleasant enough comic charge to all this absurdity which Herzog doesn’t shy away from, but by the end, it feels more like a Herzog brain dump than any kind of journey towards meaning. So the problem is that the film is too weird – unless it’s that the film isn’t weird enough. Sacrificing conventional narrative logic isn’t necessarily a fault unless there’s nothing particularly interesting to replace it with. Lynch, after all, has made a staggering career out of twisting Hollywood imagery and TV tropes into logic-defying dreamscapes in films like Mulholland Drive, and Herzog, whose films have so often focused on examining insanity, is no stranger to bending narrative rules to portray madness in films as different as Aguirre: The Wrath of God and the recent Bad Lieutenant: Port of Call New Orleans (shot at the same time as this film and far superior). But the surrealities of Son seem rather tame and unimaginative – Herzog spends far too much time lingering on shots of an oatmeal can rolling down a driveway and a basketball stuck in a tree. And while the always-reliable Shannon does as well as any actor could do with his opaque role, investing it with jittery intensity and frightening bursts of off-kilter paranoia, Herzog never dives deep enough into the character to inspire the kind of insane spark that has characterized many of his other lead performance (like Nicolas Cage in Lieutenant or Christian Bale in Rescue Dawn). In retrospect, it’s not surprising that the film turned out this way. Putting together these directors and this cast is without a doubt creating a true filmmaking super-group and super-groups are an inherently fraught enterprise. And after all, for every band like Cream or CSNY, you get a dozen like Chickenfoot and Yoso. You may not have heard of the latter two, which is the point. The Sebastian Junger Afghanistan documentary Restrepo also plays this weekend at the Kentucky Theatre. Get Low (Bill Murray, Robert Duvall) is held over this week at The Kentucky. Read Raj’s Ace Review Here. Click here for movie times or movie tickets via moviefone. To rent via Netflix click here. The Kentucky Theatre may be the cinematic mecca of Lexington, but look hard enough and you’ll find plenty of other opportunities to take in quality offbeat cinema. One of most consistent sources is the biannual film series put together by the Bluegrass Film Society, which holds free screenings every Wednesday night at 7:30 in the main auditorium of the Bluegrass Community and Technical College. According to Prof. Michael Benton, who has been running the series for the past six years, the goal of the series is to expose audiences to new ways of “seeing the world and being in the world” through world cinema, political documentaries, and American independent cinema. The Austrian film Revanche, which the society is screening on September 29th, fits into that mission perfectly by creating a distinctly European spin on the traditionally American genre of noir. A plot description of the film may suggest a typically lurid potboiler – a brothel bouncer and his working-girl-friend set out to escape from the pimp that controls both their lives, but a series of bad luck lands them in a tangled village drama. What separates Revanche, and what makes it so thrillingly unpredictable, is its introduction of a new element into the cynical rules of noir – that of hope. Revanche sidesteps the kind of bleak fatalism that is so in vogue throughout world cinema these days – in everything from mega-blockbusters like The Dark Knight to art-house fare from directors like Michael Haneke and Lars von Trier – but it earns its suggestions of redemption by engaging with the brutal realities of the world. As shot by director Gotz Spielmann, it’s also an entrancing and curiously suspenseful experience – Spielmann’s film is primarily composed of elegant, static shots, but his suggestions of what’s happening at the edges or outside the frame give the film a tense edge. Revanche was nominated for a Foreign Film Academy Award in 2008 but lost, which is a testament to its quality – the Academy, which has been famously out-of-touch with world cinema for years, would never go for a film this subtle, this moving, and this powerful.